Kölsch (German pronunciation: [kœlʃ]) is a style of beer first brewed in Cologne, Germany. It is unusual because although it is warm fermented with ale yeast, it is then conditioned at cold temperatures like a lager. This hybridized brewing process is similar to some other central northern European beers such as Düsseldorf's altbier. Kölsch has an original gravity between 11 and 16 degrees Plato (specific gravity of 1.044 to 1.065). In appearance, it is bright and clear with a straw-yellow hue. 10-liter barrels of Kölsch, called "Pittermännchen"
This type of beer was first called Kölsch in 1918 to describe the beer that had been brewed by the Sünner brewery since 1906, developed from the similar but cloudier variant Wieß (for "white" in the Kölsch dialect). By the start of World War II Cologne had more than forty breweries; only two were left by the end of the war. In 1946, many of the breweries managed to re-establish themselves. In the 1940s and 1950s, Kölsch still could not match the sales of bottom-fermented beer, but in the 1960s the style began to rise in popularity in the Cologne beer market. From a production of only 50 million liters in 1960, Cologne's beer production peaked at 370 million liters in 1980. In the 21st century, price increases and changing drinking habits caused economic hardship for many of the traditional corner bars (Kölschkneipen) and smaller breweries, and by 2005 output had declined to 240 million liters. In 1986, the brewers of Köln agreed upon the Kölsch Konvention, which set out the brewing process that had to be used, and restricted the use of kölsch to breweries that were within 50 km/30 mi of Köln. In 1997, Kölsch became a product with protected geographical indication (PGI), expanding this protection to the entire EU. Currently thirteen breweries in and around Cologne meet this convention, anchored by Früh, Gaffel, Reissdorf and Kölner Verbund [de]. Smaller brewers include Mühlen-Kölsch and Bischoff-Kölsch [de]. 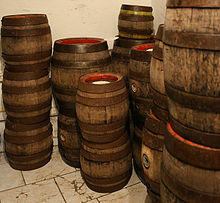 Exports of Kölsch to the United States, Russia, China and Brazil are increasing. Exported Kölsch does not need to strictly comply with the Provisional German Beer Law, the current implementation of the Reinheitsgebot. In Cologne, Kölsch is traditionally served in a tall, thin, cylindrical 20-cL glass called a Stange ("spike" or "rod"). The server, called a Köbes, carries twelve Stangen in a Kranz, a circular tray resembling a crown or wreath. Instead of waiting for the drinker to order a refill, the Köbes immediately replaces an empty Stange with a full one, marking a tick on the coaster under the Stange. 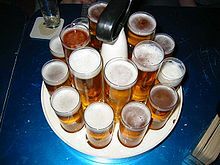 If the drinker does not want another refill, he or she places the coaster on top of the empty Stange and pays for the number of beers marked on the coaster. Wieß [de] (transliterated as Wiess pronounced [viːs], for "white" in the Kölsch dialect) is a cloudy, unfiltered version of Kölsch. As noted above, Kölsch is a product which has a protected geographical indication (PGI) in Europe. This protection is not recognized outside the jurisdiction of the EU, and many small breweries outside Europe produce an ale aged at low temperatures and subsequently called "kolsch". ^ Ray Daniels, Designing Great Beers (Boulder, Colorado: Brewers Publications, 1996), 127-8 and 136-9. ^ a b c Arnold, John P. (1911). The Origin and History of Beer and Brewing. Chicago: Alumni Association of the Wahl-Henius Institute of Fermentology. ^ Bolsover, Catherine (1 October 2011). "Cologne's favorite beer, Kölsch, makes new friends abroad". Deutsche Welle. Retrieved 1 October 2011. ^ "Kölsch Beer Glasses". Lee Valley Tools. 2018. Retrieved 27 September 2018. ^ Porter, Erin (6 February 2018). "Beer of Cologne: Koelsch". TripSavvy. Retrieved 27 September 2018.